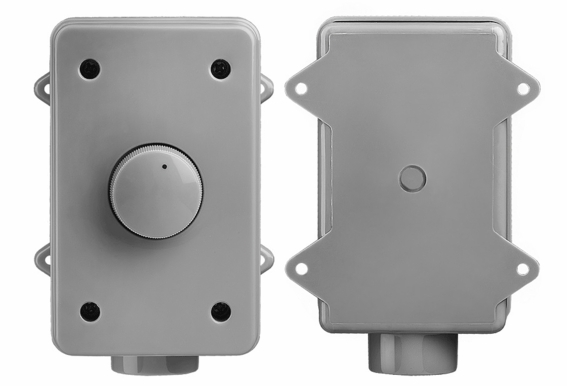 Easily control between one and eight speakers with the OVC100 Outdoor Volume Control with Self-Impedance Matching (100W). 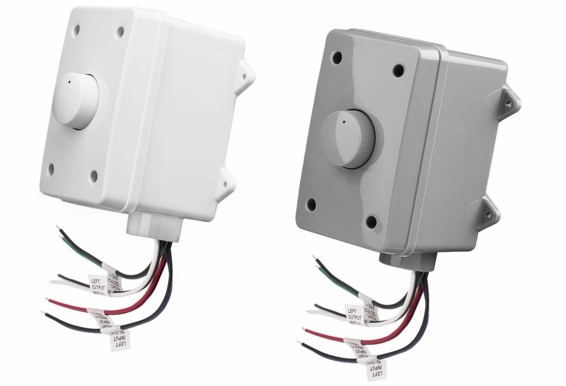 Built with impedance matching and weather resistance, this controller is ideal for outdoor decks and patios. Featuring high permeability steel in the volume control core, this speaker volume control helps you create a rich, full sound performance without bass roll-off. 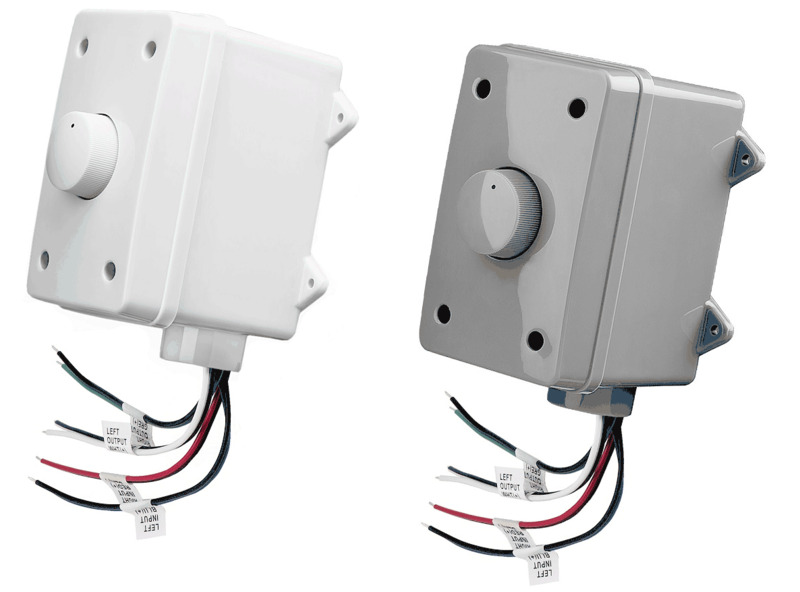 This speaker volume control includes an easy access impedance matching switch and a metal mounting plate with matching plastic. 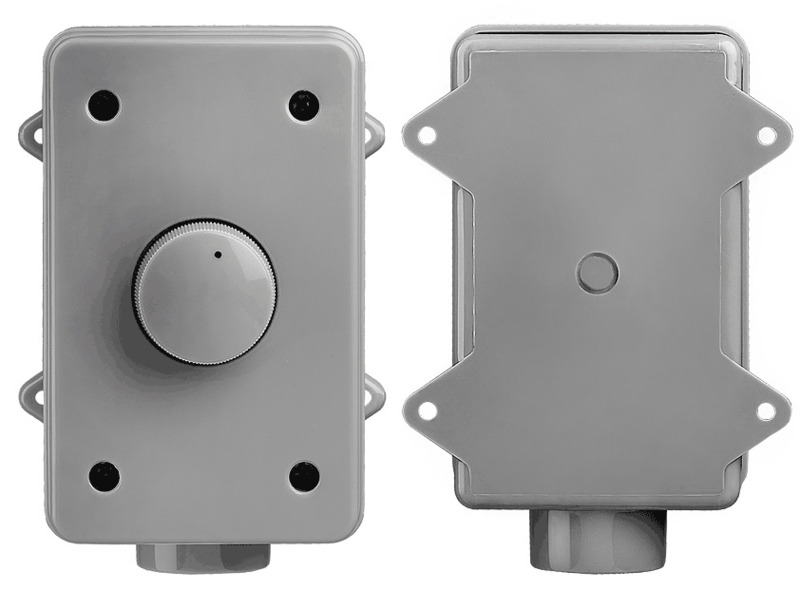 The OVC100 Outdoor Volume Control with Self-Impedance Matching (100W) has a power rating of 100 watts, peak 20Hz-20 kHz and 8 ohms stereo and comes with a 1-year warranty. Pure Resonance Volume Control 100 Watts of optimized sound quality minimal bass roll-off and can control 1-8 pairs of speakers simultaneously with impedance matching. The autoformer design features outstanding sound quality due to high permeability steel utilization in the volume control core. The speaker wire inserts use lock clips and are detachable allowing you to connect with ease to your speakers. Come with Grey or white face plate. Can you provide any guidance on if the grey color of the box will match grey pvc pipe? Do you have any recommendations on a brand to buy that will match? I only get audio if the volume control is in the fully on position. I do not get any audio on any of the lower volume settings. What is wrong? considering this OVC100. To volume control a set of AP840 outdoor speakers. Power from a Denon AVR-S700W, 70 watts per channel at 8ohms. . 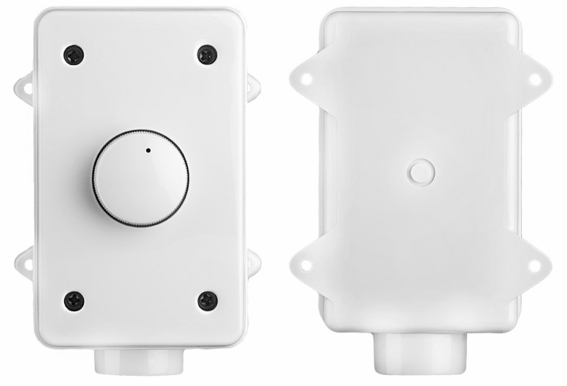 I'll have 2 sets of MK650 inside on the main channels and and the AP840 outside on the back channels. Just for music. Will the OVC100 do the jof? Can you use this VC with the BT650 speakers? If so how do you connect. Using 4 sonos connects (1 for each zone) with the the OSD MX1260 High Efficiency 60 Watts x 12 Channel (4 Ohm stable) Bridged Mono 80 Watts Amplifier (Product code: OSD-MX1260), will I be able to control the volume in each zone via the sonos app or do i need to purchase 4 volume controls too? Currently using my yamaha receiver with an analog input from a play 5 speaker I can control the volume in zone B using the Sonos app. Can this product be used in harsh winter climates? I noticed none of your outdoor VCs have on/off capability. Is there any concern if I leave all of my zones at the lowest setting for extended periods of time without powering off the amp? Could this cause harm to the amp? The owner's manual notes that this can "Control: Up to 2 speakers." But the description on the site says 1-8 speakers. Which is it? Also, if this can handle more than one-pair of speakers, are the conduits large enough to accept multiple sources of speaker wire twisted together? I currently have a high-end marine stereo on a boat with two pairs of speakers attached, one pair in the cabin and one pair in the aft cockpit area. I want to add a set of speakers to the bow of the boat and was thinking that I would parallel off of the pair of cabin speakers. When completed I'm concerned that if I turn up the volume to hear the bow speakers that the cabin volume will be too high. Can I use a fader control such as this to "balance" the two paralleled pairs of speakers so that the bow pair is louder than the cabin pair? I'd like to be able to independently control the volume of two pairs of outdoor speakers. 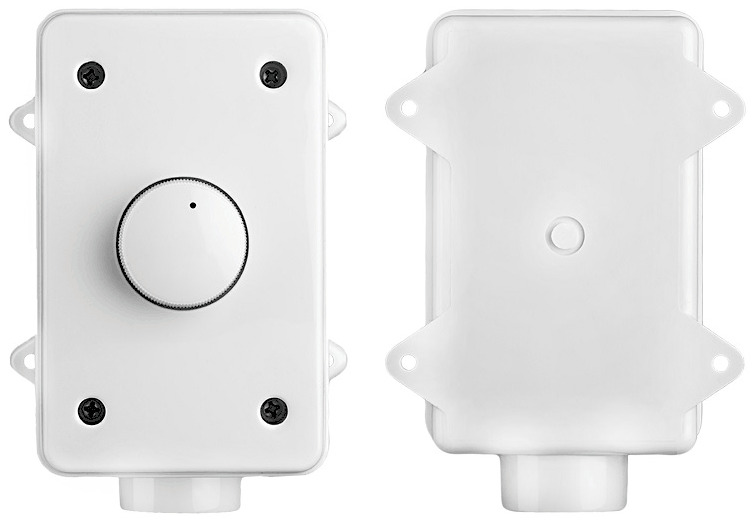 I'm only running one pair of speaker wires outside and was thinking that I needed two of these volume controls, or some type of outdoor speaker switch (which I don't see on your site) to be able to switch between A, B or A+B. My amplifier can handle low impedance without an issue. Is this unit stereo in and stereo out? Is this all I need to control the volume of a stereo pair of spkrs outside?? This is Edward Kehoe again. I asked a question about the above Outdoor Volume Control QVC100 that I bought on your order Number 227879. You asked me how many amp I was running to the volume control. But you sent it on a do not reply email. I am running a Yamaha RX-V2002 natural sound AV Receiver. It shows that I am running 100 watts to each outdoor speaker and it is about 120 feet from the receiver. I have the specification page scanned, but I have no way to send it to you. 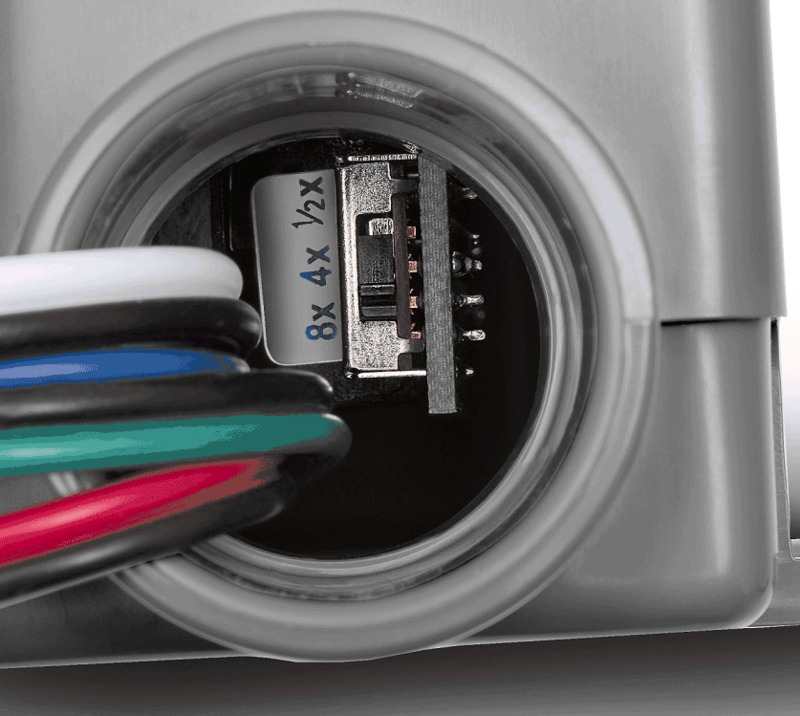 If the wires were to be crossed with the speakers disconnected and the receiver turned on, would that effect the OCV? I really want to get this system up and running again, I just want to avoid destroying the OCV. If I need something different, that would be no problem for me. The thing worked perfectly last year. Hi Edward, You would probably want to run the OVC300 since it can handle more power per channel than the OVC100. As for wiring, I don't believe that would cause any damage to the volume control but do make sure the wiring is correct to get proper sound quality. I just bought the OVC 100 along with a pair of the rock speakers (thanks). I have an Onkyo Amplifier where the "B" Channel is supplying a single set of patio speakers running to the pool. My goal is to use the OVC100 to control the volume for the new rock speakers and existing Patio (Outrigger Jr. 8 Ohm) simultaneously. . On the output on the OVC, would I just connect two Lefts (one Rock Speaker, one Outrigger) with the Left Output and same approach with the right. I am looking for consistent volume and didn't want to control each set of speakers differently. Hi Tim, Yes, you would just parallel both speakers on each channel. How many watts per channel does your receiver push out? When wiring up an AV amp, but using the multi channel setting, would you use rear left and right for a pair of outdoor speakers and wired through one of your OSD-OVC100 sound control boxes? My setup is the following Onkyo TX-8050 80wpc w/zone A+B Zone A is used in the living room Zone B is used in the dining room. I have installed another pair of speaker for the patio. When I want to use these speakers, I simply swap the connectors on Zone B at the back of the amp. Simple but a bit annoying... I plan to install a speaker selector for controlling where I want to redirect Zone B speakers. Can the OVC100 be installed between the patio speakers and the selector ? How impedance matching on the selector will interract with that on the volume control ? Hi Simon, This volume control can work in line with a speaker selector but you first want to make sure your amp/receiver can handle the load created by multiple sets of speakers, volume controls and a speaker selector. I am installing 2 sets of Yamaha speakers, 1 set is NS-AW190BL (120 watt peak, 35 watt rms) and 1 set of Yamaha NS-AW390BL (130 watt peak, 40 watt rms). They will be driven by a Yamaha RX-V377BL amp. I want to have a volume control for each set of speakers. Which ones do you recommend and what should the impedance setting for the volume controls be set at? The speakers that I have are 6ohm. Thanks for your help! Hello Mickey, If you will be running each pair of speakers from a separate zone on your receiver, you can use the OVC305R which is not impedance matching, thus you would not need to switch anything. If you use the OVC300 however, keep the impedance at 1/2x. I have a new construction home into which I had wired four outdoor speaker outlets, two each on the back porch and the deck, On the back porch is a volume control enclosure (no switch yet) from which six pairs of wires exit...left and right porch, left and right deck and two inputs. The inputs run back through the walls and terminate behind the wall behind my A/V receiver. Simple, right? What I would like to do is have two volume controls so I can control the volume on the two pairs separately. Can I do that with the wiring as I described? I assume it would be no problem to control all four with one controller, two inputs and then basically "doubling up" the pairs? As you can see from my question, I am a total newb. Thanks in advance! I know very little about A/V, so I need some help! We just bought a new house that came with some under-deck Bose 151 speakers mounted about 20 feet apart, with wires from each running separately into the house. We connected them to an old Onkyo TX-901 (45W) receiver and they sound great, but we would like an outdoor volume control for convenience. Is the OVC100 the proper volume control for this application? And does it make a difference whether the volume control is located much closer (say 3-4 feet?) to one speaker than the other, or should it be somewhere closer to the middle? Thanks! I am ordering the AP490 patio speakers. Will this control work with these speakers? I have 3 sets of outdoor speakers running off of a Phoneix Gold ISM4 splitter. I would like to install volume controls over these 3 locations. 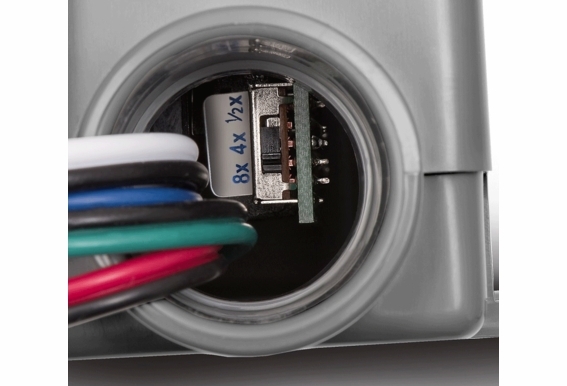 1) If a speaker is rated "4-8 ohms" what setting should that control be. 2) The 2nd set is 8 ohms. What would be that setting, independent of the other two? 3) Not sure what the 3rd set is, probably 4 ohms. I am assuming each selector would be set independent of the others?? Or all 3 must be considered when setting the selectors for the 3 different speakers sets over different lines. I have this volume control about 1ft away from the left speaker, and the right speaker is about 20ft away. The right speaker have virtually no volume at all. I can her it if I put my head right up to it. I swapped speakers left to right and still the right speaker isn't getting any volume (confirming both speakers are good though). If I move change the balance on the amp to all left I get pretty much the same thing (as expected, all sound coming from the left speaker) but if I put it all the way to the right I get nothing. Again, putting my head up to the right speaker I just barely hear it. I have the volume control at the default jumper setting. Would changing it fix the problem? I have (2) Pairs of AP520, (2) OVC100, and (1) AMP120. One pair of speakers goes to the first OVC100 and the second pair of speakers goes to the second OVC100. The outputs from A on the amp go to the first OVC100 and B outputs go to the second OVC100. What do I need to set the volume controls to? Thank you! By default, What is the impedance switch set to? I am running wires from my indoor amp to my outdoor jacuzzi. Jacuzzi has built in speakers (similar to boat speakers). When I hook up the wires to speakers, I get no sound. Yet I've verified that the wires are providing good sound by hooking up an indoor speaker. What do I need to make this work right? Does anyone have a picture of the back, I can not believe there is capability to hookup 8 speakers! 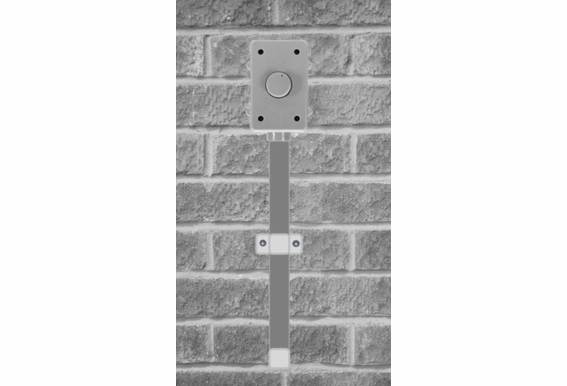 Have a place in the wall set to put in a volume control, can this unit be used? 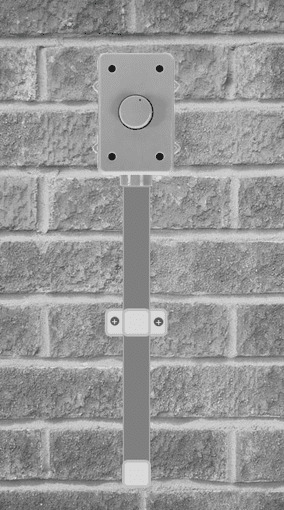 Or is it strictly self standing unit to be attached to a conduit?